Untagged Parkin WT was transiently transfected into Flp In HEK293 stable cell lines expressing either Flag alone, PINK1-Flag Wildtype (WT) or PINK1-Flag Kinase dead (KD). Parkin S65A mutant was transfected into PINK1-Flag WT stable cell lines. Cells were induced for PINK1 expression with doxycyclin for 24 hrs and stimulated with CCCP (mitochondrial depolarizing agent) for 3hrs. 0.25mg of whole cell lysate was immunoprecipitated for Parkin with 5ul of PARKIN S966C antibody (3rd bleed) coupled to Protein G sepharose. Proteins were resolved by SDS-PAGE and subjected to western blot analysis. The blot was probed with S210D phospho S65 antibody overnight at 4°C. Antibody recognises Parkin Ser65 when it is expressed in cells containing active PINK1 and not in PINK1 KD background. 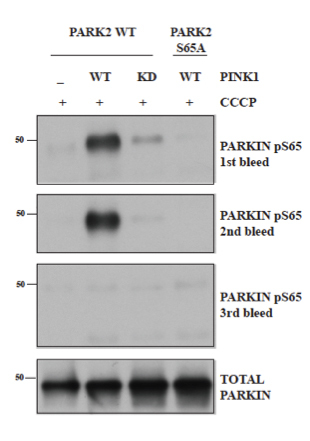 Also the specificity of the antibody is confirmed with loss of recognition of Parkin S65A mutant.